It was a good weekend, in lots of ways. 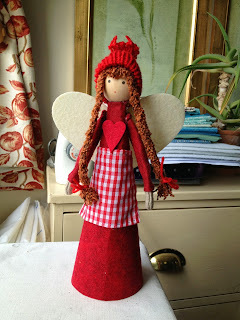 The weather was perfect for this time of the year, so I got on with lots of jobs in the garden, as well as lots of sewing things. First of all, last night I finished the Harlequin Quilt. It will now be put away for someone special. It's a secret so I can't say who. 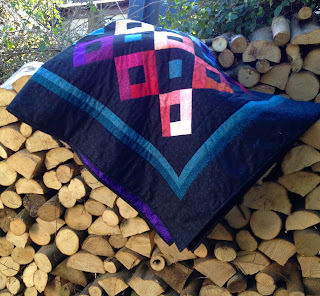 I hand quilted it in the ditch all over. 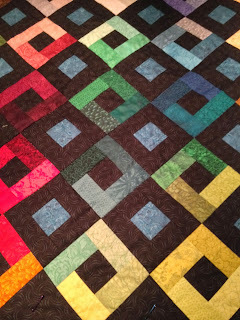 There was enough going on in this quilt with all the different colours, 150 in all, that no quilting needed to be seen as well. I am very pleased with it, having had the quilt kit for over eighteen months, I feel like I have finished another UFO.. This gate seems to be used a lot to photograph my quilts. Its the sliding gate to the holiday cottage, and makes quite a good backdrop. My other favourite place is one of the wood piles. We have had three ton of logs delivered for the winter and all are neatly stacked, ready for our cosy wood burner.. This is to be my next sewing job. 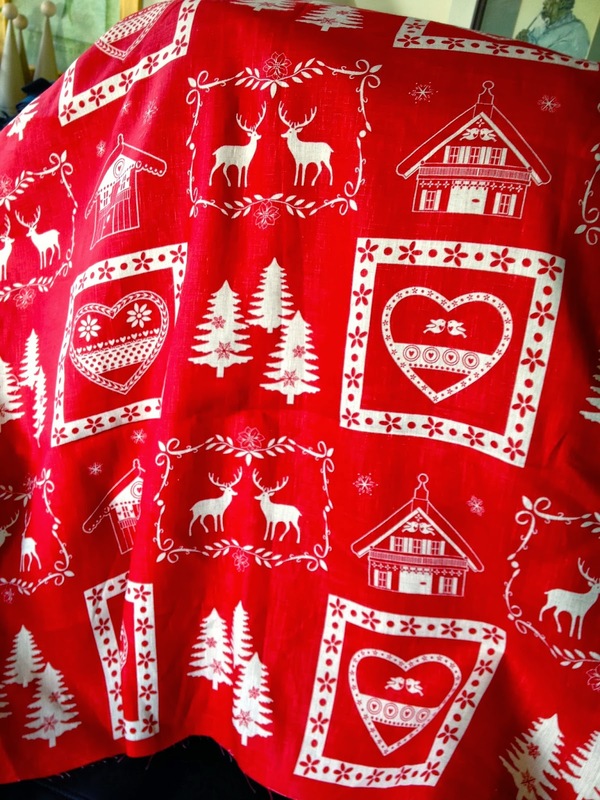 I bought this large linen panel and thought it would make a wonderful Christmas table cloth. I think it is by Stoff, though it is not marked on my bit. Just looked up on Quilters Haven, and it was Stoff. This photo is not very good as it is much redder more cherry red than this picture shows. My friend who came to stay in the cottage last week gave me a lesson on easy rolled hems, so I am going to give it a go..
Last but not least, this is Gladdie our Deer Hound, she knows she is not allowed on this settee, and not only that she thought she would pull down a cushion to lay her head on. Cheeky monkey! Normal procedure when about to write blog is take photos, wait for iCloud to put them on computer, crop and sort out, then off we go. Well, all my lovely photos are off on a big cloud somewhere, but definitely not on my computer. Oh no.. my computer definitely has a mind of it's own, and did not like this new up grade for sure. After two days of trying to sort things, I had to enlist help from No 1 son via FaceTime, and all is sorted now. So here is a very late blog this week. You might remember me buying this book by Tula Pink, some weeks back. Well, so as not to be left with blocks that I was not sure about, I have started at block No 1 and intend to work my way through to No 100. So far I am using my scraps from the Egyptian triangle quilt, and intend to add in more aqua/ turquoise as I go along. I have sorted through the stash and scrap bins and I sure have enough for these little blocks. This is block No 8 and it has 28 pieces in it and it ends up 6 1/2" finished!.. Steep learning curve for me. I have also been working on my Jinny Beyer quilt, which I now see is called Harlequin Charm. 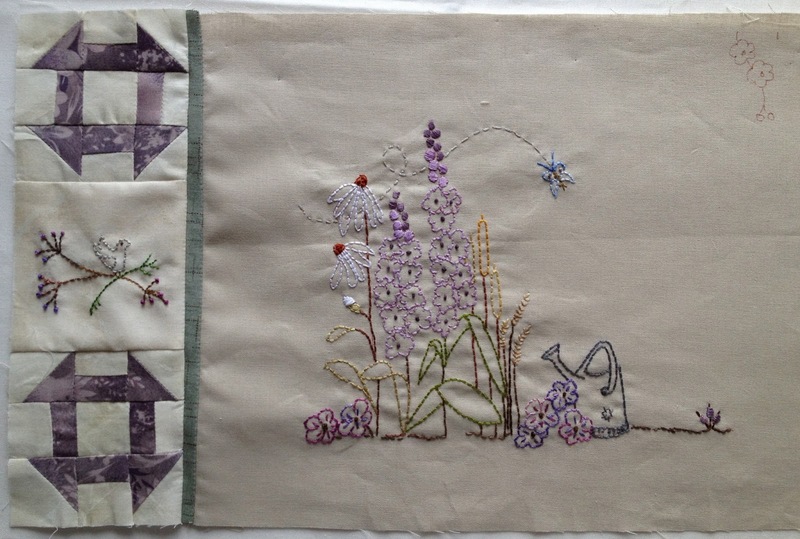 Hand quilting in the ditch and the middle is finished, just the borders to quilt now. 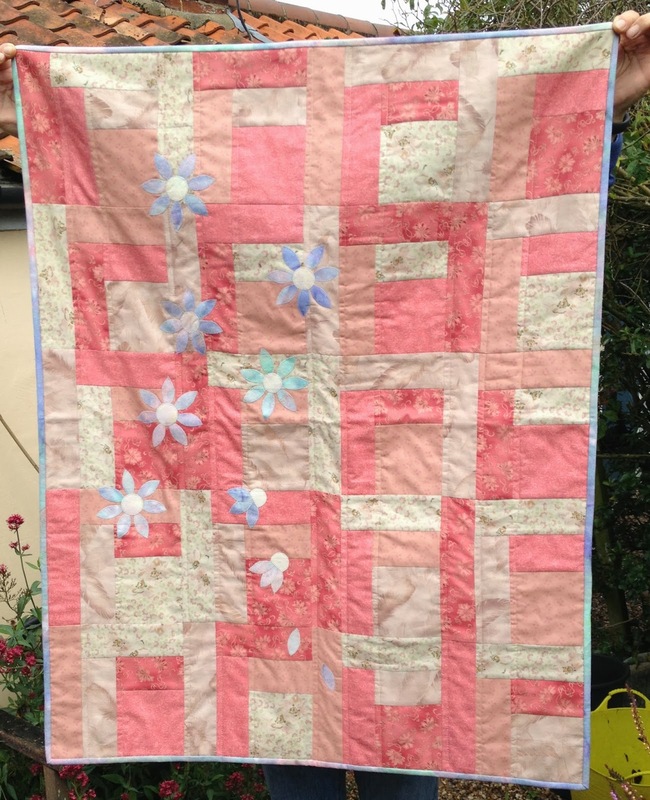 I do find hand quilting in the ditch very boring, but I did think there was enough going on with all the 150 colours in this quilt, that it was the only way to go. The winter schedule has started on TV Downtown Abby etc so I don't mind so much sitting and hand quilting..
Centre of quilt hand quilted in the ditch. Work has also been going on my socks for Christmas (while telly watching), and as you can see my sock Buddy is presiding over the first five pairs. 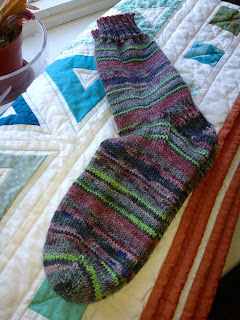 Now to cast on the sixth pair. 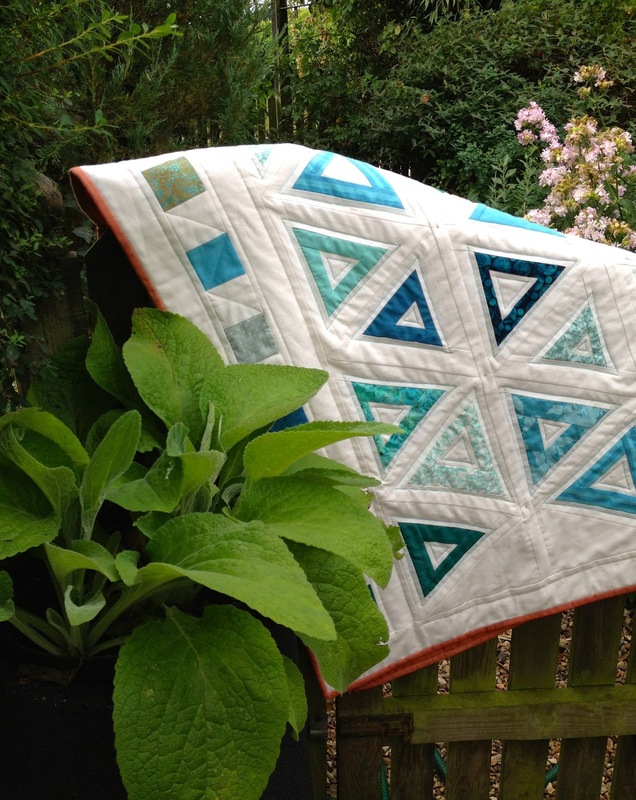 So it's back to the next block in the 100 Modern Quilt Blocks, the hand quilting can wait till this evening (if there is something good on the telly).. The last time I talked about the" Pink Thing", it was residing in the maybe, maybe not pile minus it's bunny, that I had messed up machine appliquéing on my new machine. My old machine was got out to do some alterations on a new pair of jeans, and I thought that while the old machine was out, I just might do the appliqué on the pink thing and see if I liked it any better. Well, I did like it a lot better. So I finished the appliqué, sandwiched it, quilted it with straight line quilting and bound it with the pretty fabric I had used for the backing. So I now have one more UFO finished and a pretty baby quilt to gift.. The Bunny did not get reinstated. I think the quilt looks good without him. who sadly is finishing her on line store at the end of October, she will be missed. But guess what, maybe a few more are in the pipeline. Watch this space. It's amazing what you can do with a paper mache' cone and a big wooden bead. Now off to do my flowers in church for Harvest Festival on Sunday.. 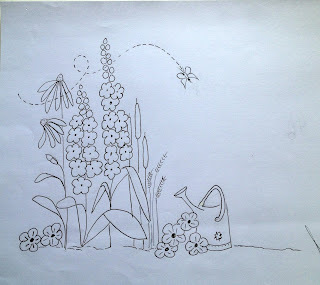 This is my 100th blog post, where does time go? This weekend one of my jobs was sorting out the BOM, and now all the blocks are designed, and yes we have an orphan block. It was going to be block 8 , but on second thoughts it is the wrong shape, so another block has been drawn up. There are 9 Blocks in all for the finished wallhanging. So here is our orphan. 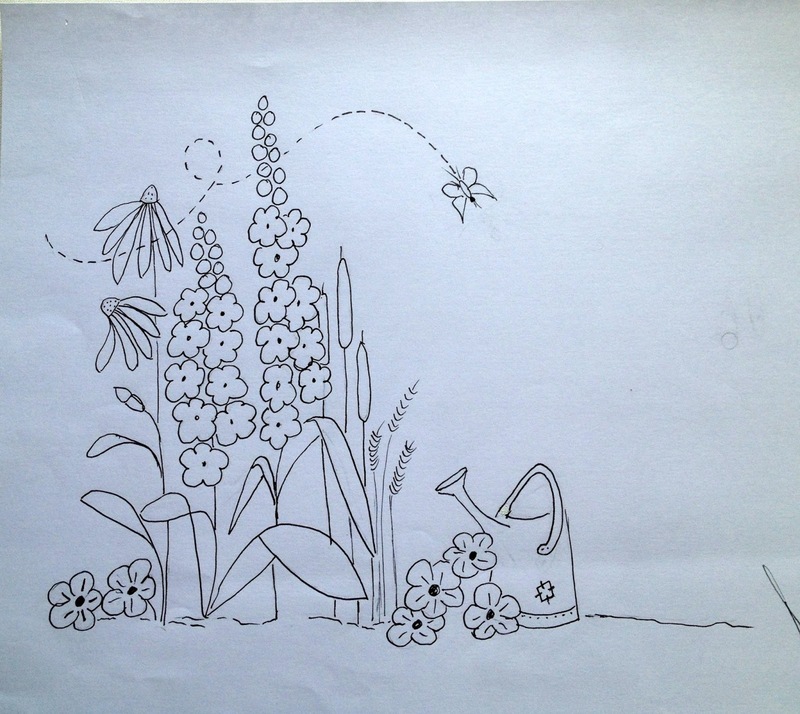 I have included the line drawing for anyone who would like to make it up. 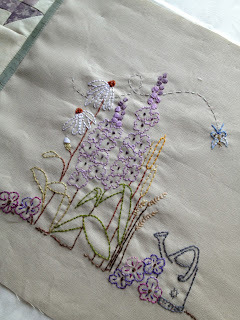 I used a combination of stitchery and Appliqué, but it could be all stitchery. The Jinny Beyer quilt was duly basted, and now I have to decide whether to hand quilt or machine quilt it. 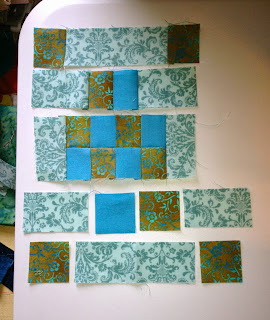 At the moment, I am leaning towards hand quilting it. It could however be due to the changing of the seasons, autumn is definitely on it's way, and as you may know I like nothing better than sitting by my wood burner, hand quilting. The fourth pair of christmas socks were finished and the fifth pair were cast on, and I made up some more half inch hexagons. What am I going to do with these tiny hexagon's I have no idea at the moment but they are fun to make. I have lots of Liberty Lawn scraps, so my thoughts are to make use of them. So all in all it was a productive week end. Lots of things got done and sorted. This was a view from one of my kitchen windows the other morning, isn't nature wonderful.. Morning Dew on a Cobweb. 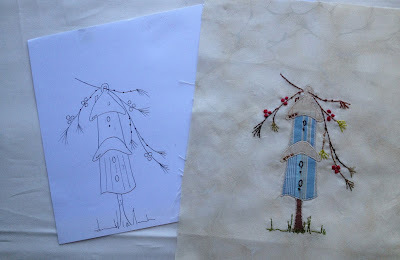 I do love the Autumn, I seem to get far more sewing done. Our winter logs arrived last week, another load arriving this week and we will be already.. for lots and lots of quilting.. Here is Block 6 for those of you who are joining me in the little BOM wallhanging. I do hope you are enjoying making it up. In month 2, you should have made two sets of Churn Dash blocks (4 altogether) with a little bird on a branch in-between, reversing the little bird on the second set. Well, now is the time to use those blocks. Add the small flat crumb catcher as you did in Block 1 to the side of the Churn Dash Blocks ,see picture. Now trace the stitchery pattern on to a 11 1/2"X 9" background fabric ( I always cut mine bigger and cut down to size after stitching). Back with stabiliser and stitch in the colours of your choice. 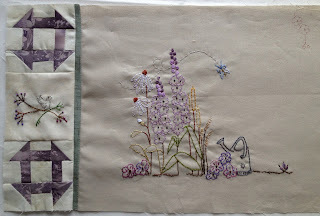 This month we are not joining on to the main quilt pieces, as it is going to be added later. 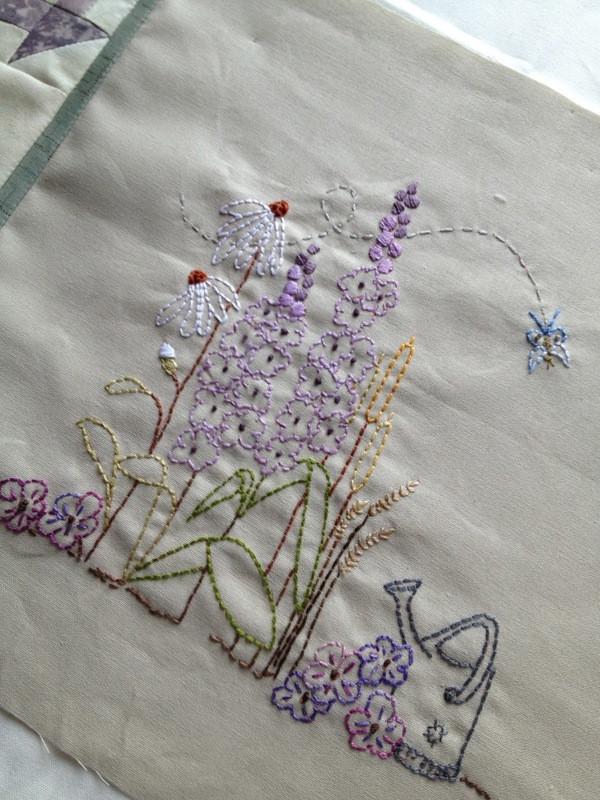 Some of you keen eyed ladies may have noticed a little bit of stitchery, flowers hanging down, top right hand corner. Well that is part of block 7 for next month.. I do hope it was worth waiting for. I am still working on my Jinny Beyer quilt and hope to get it sandwiched this weekend, as the top is now finished.No good pictures as yet..
Dilemma indeed, I have looked at all my UFO's and not one of them is saying finish me please, and I can't decide on a new quilt pattern. 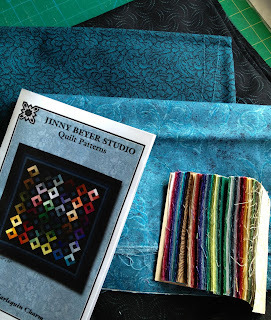 About 18months ago, my friend Maggie and I purchased a quilt kit each from Jinny Beyer and I have not even opened mine. Now is this a UFO as I have had it for such a long time or a new project? A bit of both I guess. Kit has now been duly opened, and oh! yes nice! 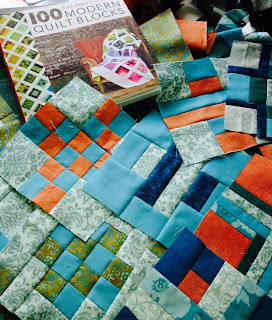 Why on earth have I not started this quilt before, and I know just who I want to make it for. So thats me sorted for the next couple of weeks , sewing wise. 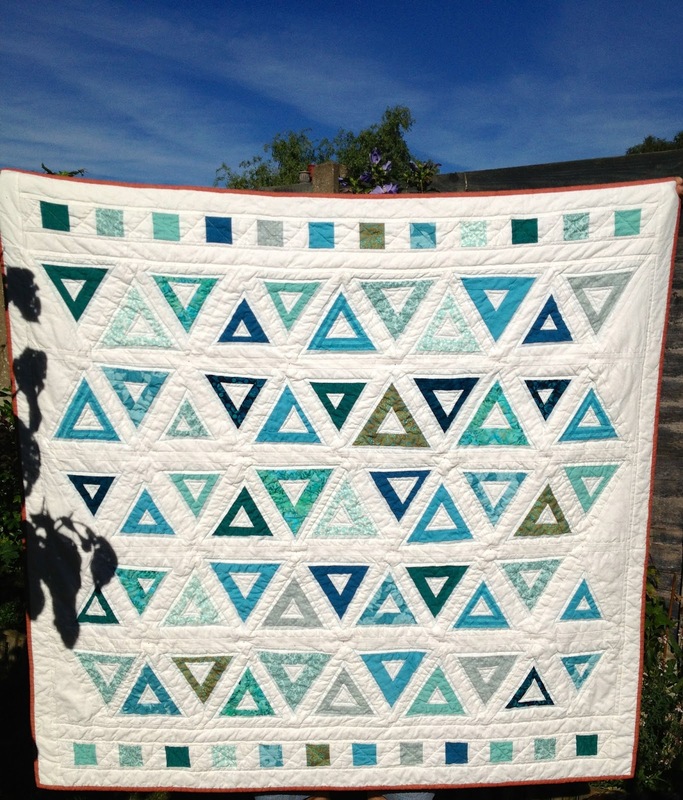 I did finish my pyramid quilt, the original idea for it came from Sunday Morning Quilts by Amanda Nyberg and Cheryl Arkison. 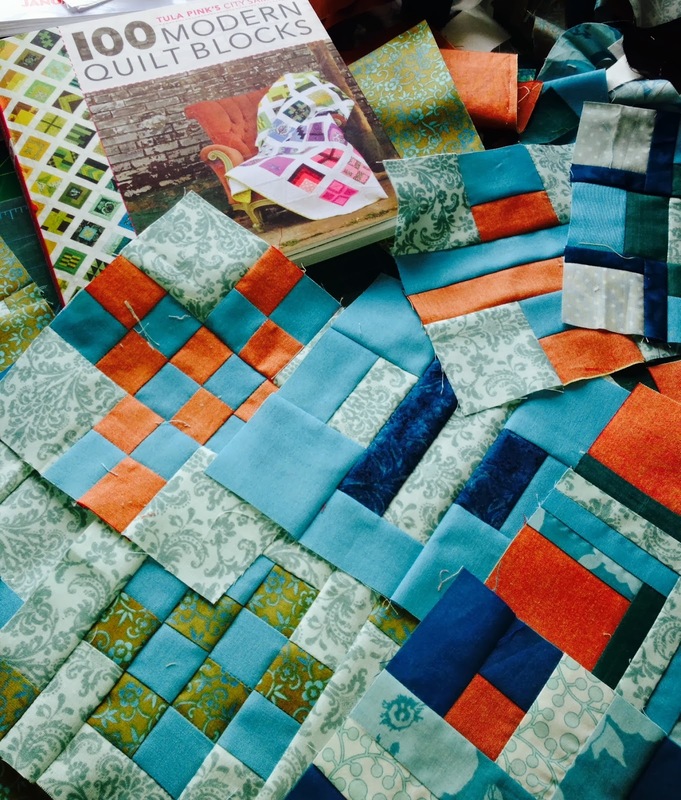 Amanda writes a lovely blog called "crazy mom quilts"
However I have changed it somewhat, including making it bigger. I am well pleased with it and this one I might just keep for me as it is so soft and cuddly. This is what it looked liked after washing. 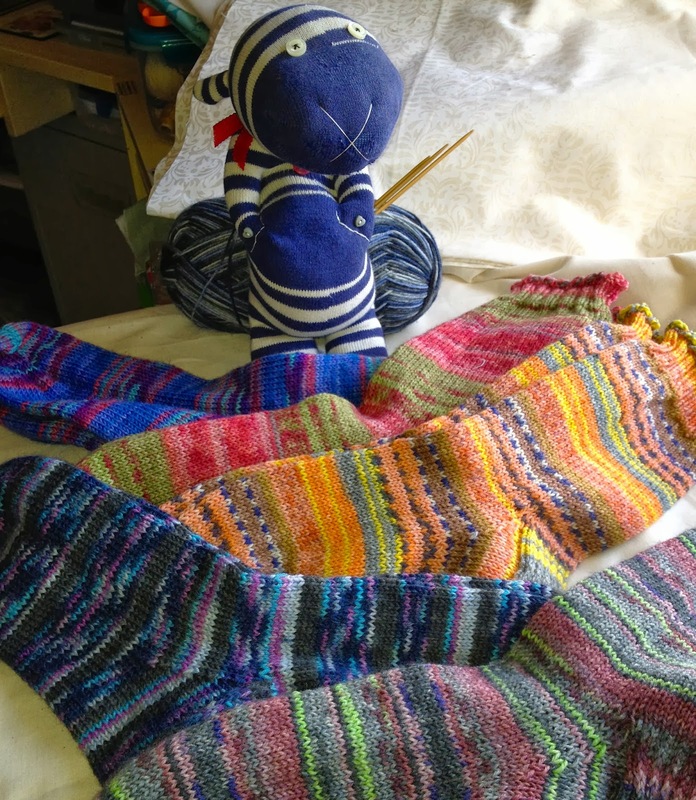 My only other finish this week is another pair of Christmas socks (No 3) so I have now started on pair No 4, this is my evening pastime while hubby watches the TV. So my hand sewing has been put on hold at the moment. I also started making some tiny Hexies 1/2". 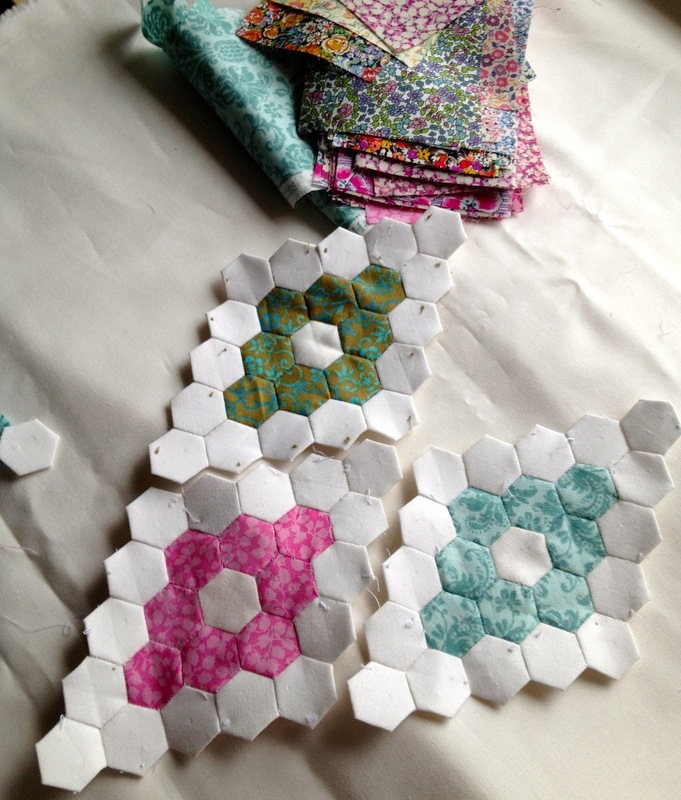 Now I have not made Hexies since the 1960's. They were for the first quilt I ever made and about 2"in size. Mainly Laura Ashley fabric as that was all the rage then. Well these little ones are fun to make, though a bit fiddly. I will take pictures when I have done a few more..